As evidenced by the deep-fried, frosting-filled Cap'n Crunch Delights it unleashed last year, Taco Bell isn't shy when it comes to applying its Doritos Locos-style stunt food ingenuity/insanity to its dessert menu. Taco Bell's latest dessert creation, which combines a quesadilla and Kit Kat candy bars, is certainly no exception. 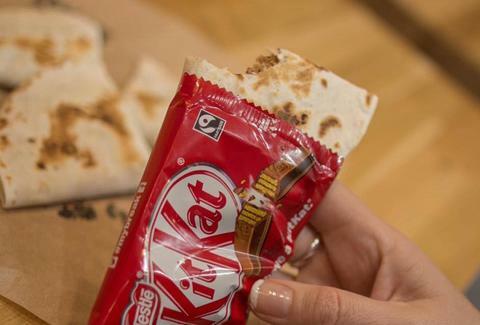 It's called the Kit Kat Chocodilla, and it's a new spin on Taco Bell's original Chocodilla, which as you may have inferred from its name, is basically a quesadilla that's filled with melty chocolate chips instead of your typical cheeses and meats. The Kit Kat version is made with a flour tortilla, chocolate chips, and most importantly, crunchy Kit Kat bars, according to a report by Brand Eating. Sounds like the perfect way to finish a meal of Crunchwraps, right? Well, don't get too excited about pounding 'em on your next midnight T-Bell run, folks, because they're unfortunately limited to Taco Bell locations in the UK so far. But seeing as Taco Bell UK and Taco Bell in the US are both run by Yum! Brands, there might be at least a slight chance the chocolaty dessert quesadillas will make their way stateside someday. We reached out to a Taco Bell spokesperson to see if and when that might happen. At least we have the possibility of free Doritos Locos Tacos to look forward to in the meantime. Tony Merevick is Cities News Editor at Thrillist and his waistline is thankful these things aren't available in the US yet. Send news tips to news@thrillist.com and follow him on Twitter @tonymerevick.